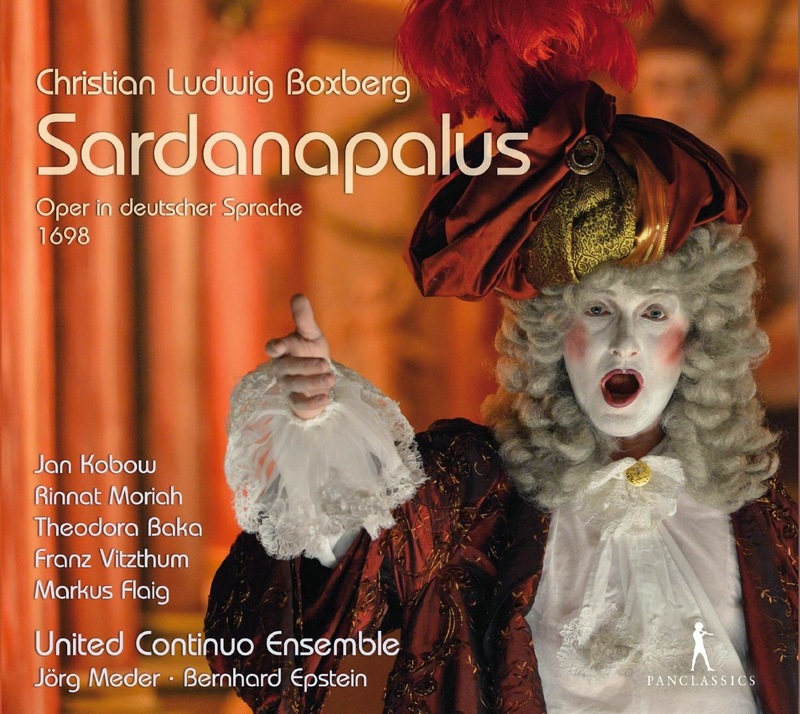 Neither Christian Ludwig Boxberg nor his opera Sardanapalus had appeard on my radar until I came across this disc on Pan Classics. Recorded live at the Wilhema Theater in Stuttgart, Bernhard Epstein directs the United Continuo Ensemble (director Jorg Meder), with tenor Jan Kobow, soprano Rinnat Mariah, mezzo-soprano Theodora Baka, soprano Cornelia Samuels, counter-tenor Franz Vitzthum, bass Markus Flaig, tenor Soren Richter, bass Felix Schwandtke, soprano Kirline Cirule and tenor Philipp Nicklaus. Christian Ludwig Boxberg (1670 - 1729) was the son of the court organist at Sonderhausen and Boxberg studied in Leipzig where Reinhard Keiser (1674 - 1739) also studied. Keiser would go on to work at the Hamburg Gansemarkt Opera, which was founded as Germany's first opera house by Nikolaus Adam Strungk (1640 - 1700). In 1693 Strungk (now the Dresden Court Kapellmeister) opened Central Germany's first civic opera house in Leipzig. Boxberg worked there as a singer, performing in the opening production, Strungk's Alceste. Between 1696 and 1700 Boxberg wrote at least seven librettos for Strungk to set for performance in Leipzig. In 1700, debt problems caused Strungk to retire, allowing Boxberg to write the music for two operas. But disputes with Strungk's heirs over who ran the opera house prevented more and he became an organist. Boxberg's operas for Leipzig do not survive. We have only libretti and printed laudatory remarks by a contemporary, Erdman Neumann. But in1698 the Leipzig company, without Strungk, paid a visit to Ansbach performing at the court of the Margrave, who was young and artistically inclined. Thankfully a fair copy of one of the operas that Boxberg wrote for this visit survives in the Ansbach archives. One of the earliest German operas, it is the earliest surviving German language opera from Central Germany. Whilst Keiser's operas in Hamburg used a mixture of German and Italian, Boxberg's opera is written entirely in German. The story concerns the Assyrian King Sardanapalus (Jan Kobow), who is uninterested in ruling and comes to a sticky end (off stage of course). He has defeated Arbaces (Markus Flaig) and Belesus (Felix Schwandtke) and imprisoned Belesus's son Belochus (Franz Vitzthum). The opera concerns the ultimately successful attempts of Arbaces and Belesus to defeat Sardanapalus. The plot is complicated by Belochus's love for Agrina (Theodora Baka), whom Arbaces loves too, and Sardanapalus's servant Saropes (Philipp Nicklaus) is in love with princess Salomena (Rinnat Moriah) who is in love with Belochus as is Princess Didonia (Cornelia Samuelis). There are two further servants Atrax (Soren Richter) and Msuis (Kirline Cirule). There is crossed love, dungeons and cross-dressing, with Sardanapalus being attracted to Atrax (who is spying for Arbaces) in female disguise. Metastasio it is not, but all great fun. A lot of plot, dealt with delight and verve. There is the customary prologue and three acts, the arias are short (18 arias plus two duets in act two) and there are ballets. As was customary at the time, the ballets are not by Boxberg but selected from pre-existing dance music. The disc was recorded live at the Wilhelma Theater in Stuttgart (see video below), and made in conjunction with staged performances at the Ekhof Theatre, Schloss Friedenstein, Gotha during the 2012 Ekhof Festival, which judging by the photos in the CD booklet was a very striking recreation of a baroque staging. The continue is provided by the seven players of the United Continuo Ensemble directed by Jorg Meder. They get a lot to do, there is plenty of recitative and many continuo arias. The ritornelli and other larger scale pieces use a further 12 instruments, including four trumpets. All conducted by Bernhard Epstein. 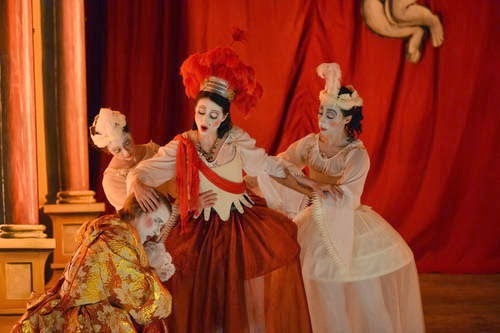 In style, Boxberg is transitional, clearly German but absorbing influences of French and Italian opera. The young cast are occasionally a little pushed, but overall they sing with style and comittment. They clearly convey the drama and the benefits of this being associated with a live performance are strong. The results are strongly characterised, lively and involving. The CD includes a comprehensive article and synopsis, but the libretto is only in German. The cast's diction is such that, if you understand German, the drama is entirely comprehensible. This is an entirely fascinating and illuminating window onto early German opera. And admirable project, performed here with flair and verve.